Have you ever wondered if reiki could be used on your pets or even if it would be an effective treatment option? 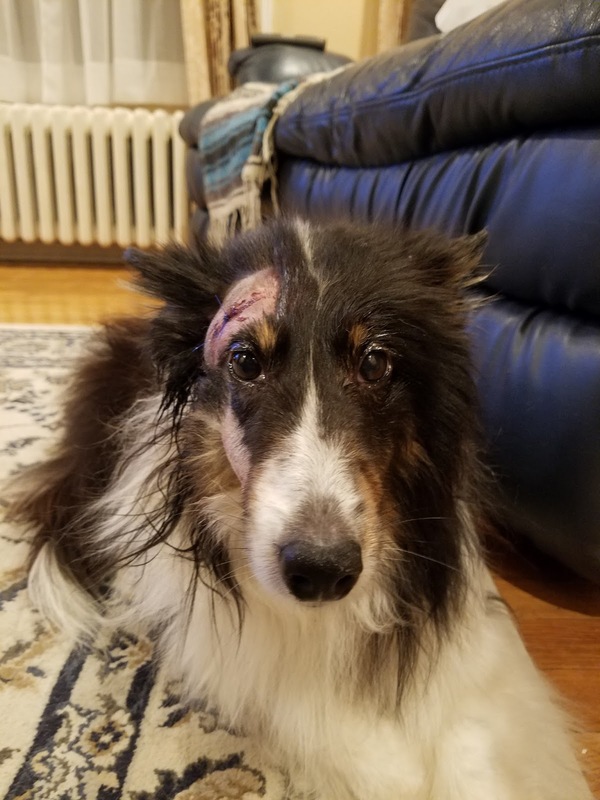 I am sharing with you my story and personal case study using reiki to heal my 11 year old sheltie, Ava, after she was attacked by another dog that resulted in two lacerations on the head and one puncture wound to her salivary gland in her face. My hopes is to shed light on the benefits of reiki as a viable treatment option especially in the area of wound care. Many times I encounter loving pet owners struggling with the health of their pets spending thousands of dollars of medications and procedures. So my goal here is to show how beneficial reiki can be for our beloved pets on many different levels without the heavy cost. Reiki is complementary to traditional medical and veterinary care. 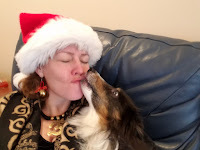 So just before the holiday, my small dog, Ava, that I use periodically as a therapy dog was attacked by another dog. This stunned me and shocked me on many levels as I did not see it coming. Usually my intuition kicks in any time I feel a dog nearby has aggression or dominance issues. Not this time. There were no warning signs. 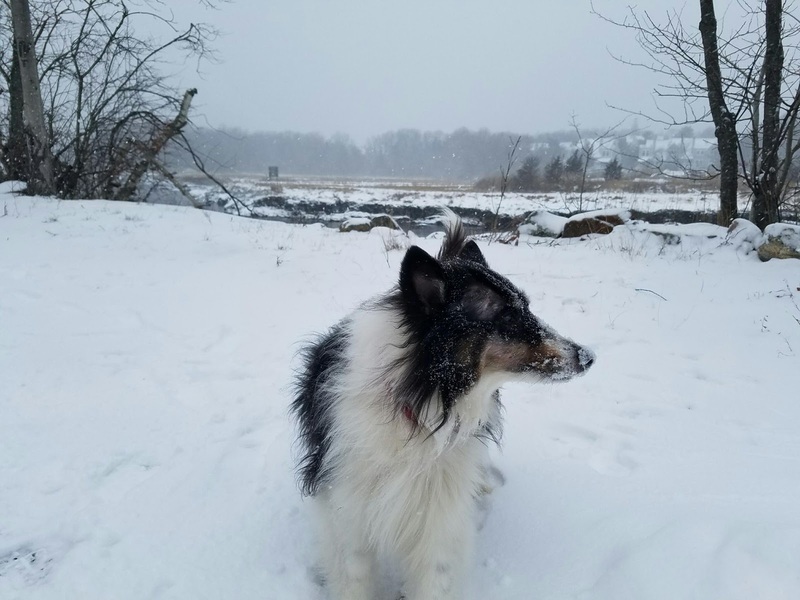 I just happened to be talking with the other dog owner about coyotes and how to watch out for them, protect their dog, while living in harmony with them when this attack happened. There is some irony here. The night before while taking Ava out for her final walk, we came within 15 feet with a coyote, but with no incidence. The coyote who trotted past did not have a care in the world or take interest in my dog. I live in an area abundant with wildlife of all kinds. So learning to live in harmony with awareness is key. We have come in contact with a coyote by itself at least a dozen times and on at least two occasions with a pack, with no incidence. I have chosen to learn to live in harmony with these magical beings that some would like to call vermin. Coyotes are omnivores whose diet vary primarily of deer, rabbits, hares, rodents, birds, reptiles, amphibians, fish, and invertebrates. Since I live near the water, we tend to have a pest issue too. So I welcome the coyote who naturally take care of the problem. I am not naive as I take precautions when I am out especially at night and take added measures to protect my pets. It starts with awareness and vigilance. I do not fear the coyote so it does not smell fear on me. There was one occasion where a coyote stopped and stared at me as if he was going to challenge me. I picked Ava up in my arms and chased him yelling just to let him know who the alpha dog is around here. 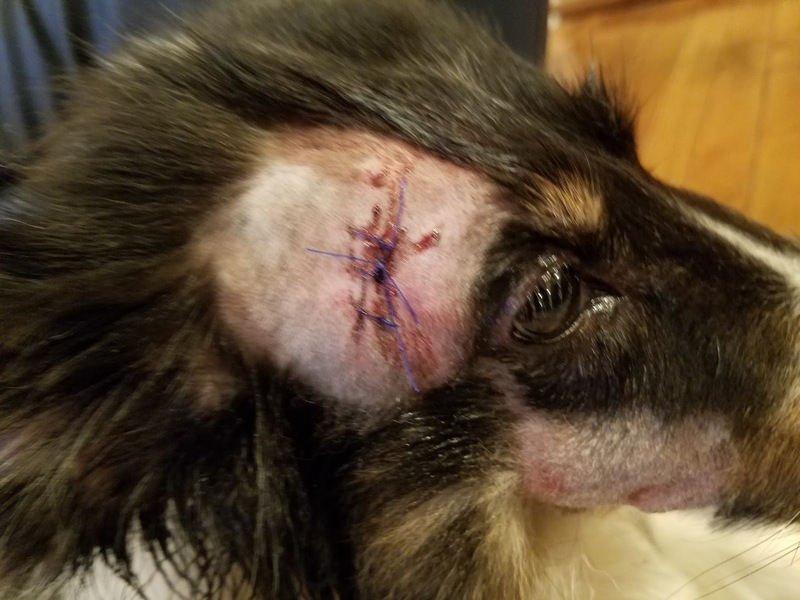 So, I was stunned that what appeared to be a nice domestic dog would just attack and rip my dog’s head open with no warning or signs. Everything I ever knew and trained for came into question. If you recall how the year 2016 ended, you might recall how chaotic the energies were then too. The cosmic energies and planetary alignment were quite intense and people were feeling it, I wondered if this seemingly nice dog did too. I am not sure as I can only presume. So instead of getting mad or upset at that moment, I stepped into action for immediate medical care for her. I chose to step back emotionally and reflect on what happened which was hard for me to grasp. 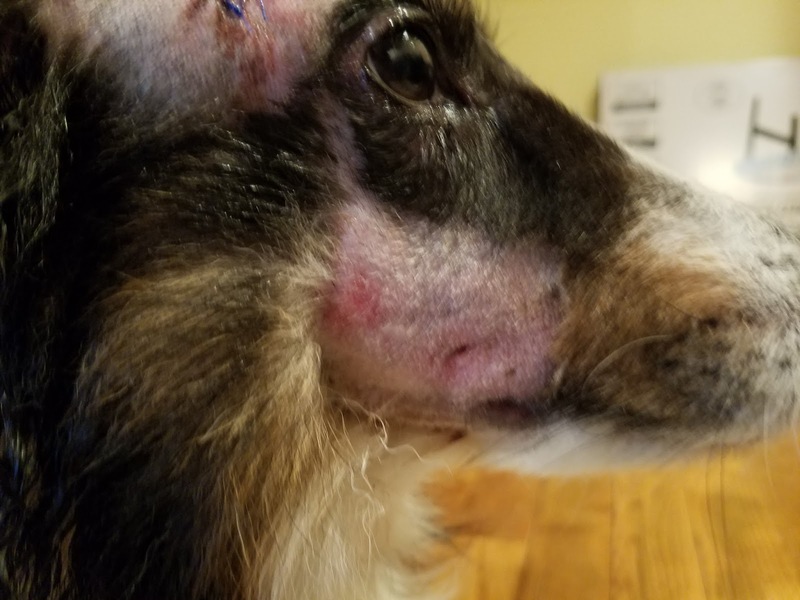 I even felt a sense of sadness for the other dog and could not only get the image of the attack out of my head, but when the other dog sniffed my hand with blood on it, it had the look like “Oh crap. I did that?” with the ears back and eyes saddened. 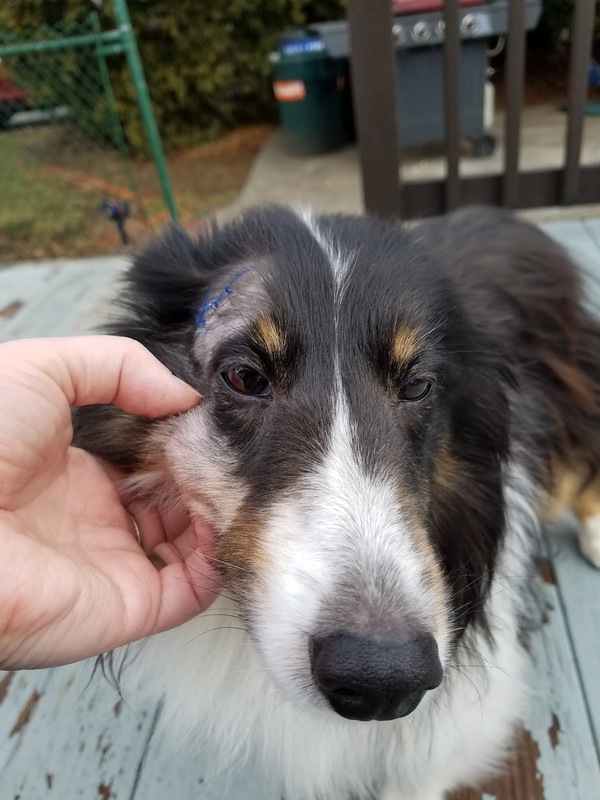 After the initial emergency veterinary care, it was discovered the puncture wound in the mouth area could not be closed since it punctured a salivary gland. Ava was sent home with the instructions of frequent warm compresses and medications. 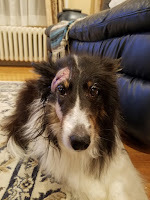 At one point, I was extremely emotional due to the ongoing ever changing wound care needs questioning every moment whether or not I was giving enough to this dog who has done nothing but give unconditional love and healing to me and so many. At first, I did not initiate reiki for the simple reason that the puncture wound of the salivary gland needed to drain and was concerned it would seal faster than needed in this case. I know how effective reiki can be, especially the Jikiden Reiki®, in healing wounds. However, in this case I struggled with the decision to refrain because in one hand, we want the wounds and the gland to heal, but on the other hand, we want the puncture wound to remain open and not close. Everything using traditional veterinary care was working up to this point and she finished her medication. However, one week post attack, things began to change. The puncture wound became harder to drain and she developed a zygomatic mucocele. At one point we were wondering if she would need surgery to repair a salivary gland and even consulted a surgeon on day 8. Upon further research, we discovered that there are only two options for her situation. To surgically remove the entire gland. This would prevent the mucocele from returning. However, despite no veterinary research to validate, I was concerned about digestive, teeth, and gum issues. How can there not be any secondary problems if the salivary gland is removed? If you understand physiology, it is a logical concern. To aspirate the mucocele to get it to drain. 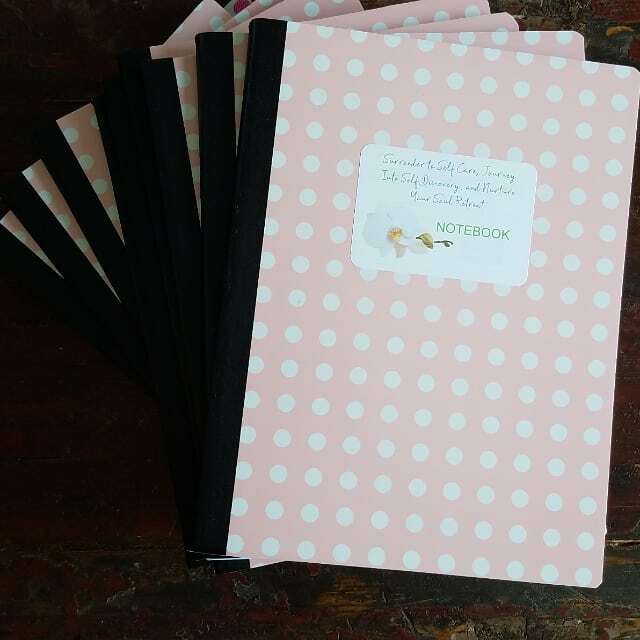 To do this showed benefits that could last months. However, from what I discovered, these results were temporary according to the veterinary medical articles I read. I began adding turmeric to my dog’s food 2 times a day – once in the morning and once at dinner time. We all know the power of prayer so I called upon the community for prayers. Within one day, day 8, her wound is suddenly improved and the surgeon opted to “wait and see” since the wound was draining fine. It was recommended to continue the warm compresses every 2-3 hours and holistic remedies. At this time I still have not administered reiki. The turmeric seemed to be helping keeping the mucocele down. However, by day 12, the puncture wound sealed and the mucocele returned preventing the accumulation of saliva to drain. THIS IS WHEN I ADMINISTERED REIKI as I was determined to not put my dog through something more traumatic of having surgery. Reiki never ceases to amaze me, yet I was still astounded at the level of toxins I felt in the wound site. There is a technique we use exclusive in Jikiden Reiki to help move the toxins in the body. I was trying to figure out how to adapt the technique suitable for a 25 pound dog. By day 15, her mucocele was stable, and not increased in size. Redness had also diminished greatly. I then decided to do an abbreviated version of this technique seen in Jikiden Reiki to see if we could help Ava enhance her healing process. Within 24hrs, the mucocele was more than 50% reduced. Within 36hrs, the mucocele opened and completely healed. One week after initiation of this technique (day 22), still no mucocele. Because of the medical research showing chances of relapse, I am choosing to continue this routine as long as necessary. At the bottom of this post, you will find links for more information regarding the mucocele and reiki. Despite my years as a reiki professional with over 10+years of experience, I find what happened here with Ava in regards to the Reiki was undeniable. So right now, I take it one day at a time with NO SURGERY or gland removal or aspiration of the mucocele planned in the future. That makes for one happy dog owner and hopefully for one happy senior dog. I hope you will consider reiki as part of your wellness and health not only for yourself, but for your beloved pet. After all, they give us such unconditional love. If you are a reiki practitioner, I hope this personal case study helped broaden your view of the reiki practice. If you are new to reiki, I hope this inspired you with options. In the end, I hope your eyes have been opened to possibilities. That individual may or may not be schooled or taught in the methods of holistic healing options or alternatives. Procedures and surgeries are costly and may or may not be necessary. So please trust your instinct and when in doubt, get a second opinion. Also, as the medical literature alludes to, procedures and surgeries seem to be the easy option many times. Hence, more convenient. If you are too busy to give your pet the care it needs, then maybe you ought consider what it would feel like if your loved one was too busy to care for you when you were hurt or sick. I apologize if this offends some of you, but it is a sad reality in our culture. All you have to do is look at the filled animal shelters to see. I am hoping this brings awareness so we can change our own behaviors. It begins within. If you would like to learn more about obtaining reiki, learning reiki, or just more information about reiki, please visit the various other posts on this blog or visit my website. Disclaimer: Reiki is not a substitute for medical care or veterinary care. Please note: Seek medical attention when necessary. These are opinions based on a personal case study and Laura’s alone. © 2015-2018 Laura Joseph. All Rights Reserved. This information is for general educational uses only. It may not apply to you and your specific medical needs. This information should not be used in place of a visit, call, consultation with or the advice of your physician or health care professional. Communicate promptly with your physician or other health care professional with any health-related questions or concerns. This article does not share the opinions of Healing With Spirit or its affiliates. Be sure to follow specific instructions given to you by your physician or health care professional. Have you ever wondered if reiki could be used on your pets or even if it would be an effective treatment option?I am sharing with you my story and personal case study using reiki to heal my 11 year old sheltie, Ava, after she was attacked by another dog that resulted in two lacerations on the head and one puncture wound to her salivary gland in her face.